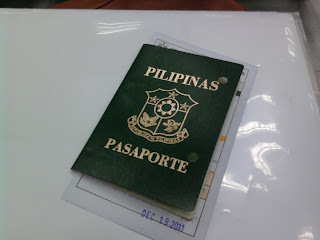 I felt slightly sad as the DFA personnel plunged two holes into my green passport as I was having it renewed. Taking its place is the more advanced - maroon machine readable passport (so not my color, haha!). As I fumbled on the immigration stamps, I found myself reminiscing about some of the great adventures I experienced overseas - Putrajaya, Kinabalu Mountain Race, hiking in Borneo, ohhh baby! Those were amazing! Well, I won't be rambling "emo" thoughts about it. I just wanted to share with you that passport renewal was a breeze! Just make sure you have all the requirements and that all information in the form are correct. Better arrive early and be in proper attire (wear a collared shirt and do not wear shorts or slippers!) I felt really sorry for those people who were refused entry because they were wearing improper footwear. One lady in a mini red skirt was also not allowed. Maong pants are okay though. I picked an early schedule which was at 8:00 AM. When I arrived at 7:30 AM, there were already hundreds of people inside and I felt slightly edgy. I don't like falling in line at all! Fortunately, queue was very quick and I finished at 8:49 am. Easy breezy. I was actually under the influence of Stress Tabs and practically smiled at every person I encountered, even the girl at the processing session who was slightly "masungit". I did not leave her desk until she loosened up a bit and almost smiled. Haha! My friend, Pinay Travel Junkie gave a much detailed account of her experience when she had her passport renewed last year. Visit her site for more details.